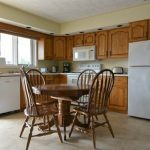 Tastefully decorated and furnished, the suite has all the conveniences of home. 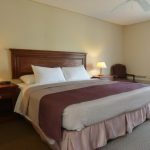 Clean, bright and spacious, the two-bedroom suite is on the upper level of the motel. A sheltered balcony runs the length of the front of the Bruce Anchor's upper level and ground level units. Guests have access to the balcony and the refreshing breeze through each room's sliding glass doors. All queen rooms on the west end have a spectacular sunset view with a glimpse of the water across the street from the motel. The clean, spacious rooms are furnished with comfort in mind. All units have two queen beds in each room. 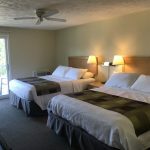 Each room has a door facing the parking lot for easy room accessibility, and a set of sliding glass doors lead to the balcony on the other side of the motel. With the breezes off of the water, the balcony is a restful spot to sit and relax.